The World War 2 is present in every cell A Matter of Life and Death. Shot in it’s waning days (they had to delay filming because their Technicolor cameras were being used by the U.S. Army). It’s there in the decision to use the thirty-something David Niven for the lead character when he’s clearly written as a twenty-something (they were busy in the war) and in the way the characters engage, and even joke, of death. War isn’t tragic or awful. It’s simply is. A part of life as natural as breathing, and death isn’t the end for most—no, it’s a reward. The world is shot in a dreamy 3-Strip Technicolor by Jack Cardiff. While other cinematographers had to had to over light every scene to show off every scrap of color shot, Cardiff willingly played with shadows, incorporating lessons learned from his hobby of painting and building the early cinematic language of color photography. He’d go one to be well known for it—winning an Oscar for Black Narcisuss. But Cardiff could shoot in black and white just as well, and while the waking world of A Matter of Life and Death is in vivid color, the heaven is shot in an ethereal kind of black and white. There’s a pleasant glow to every scene there, and the black and white photography serves to root the world in reality and contrast with the wildly fantastic setpieces—including a stairway to heaven (it was a 20-foot wide escalator that required a 12-hp engine just to run). Heaven is a world of breathtaking beauty, but devoid of color, while earth looks like the palette of an artist, but is plagued by war and death. 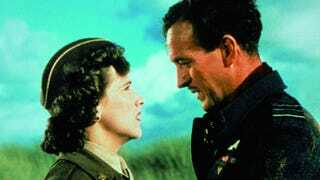 David Niven’s character, Peter Carter, is a kid yanked out of college to protect his country. When his bomber is blasted by enemy fire the rest of his crew bales and he’s left alone with no parachute and the body of dead friend. He contacts the closest aerodrome, where young American radio operator June (Kim Hunter) hears him. They just have those first few minutes of the film to fall in love. They can’t see one another. Can’t know more than she’s American and compassionate, and he’s British and clever, and that they’re both so brave in the face of death. Because he’s resolved to not die in a plane crash. He’d rather jump out, with no parachute, then go down in a blaze. And so, like Peggy Carter would do 65 years later, it’s left to this one lone woman to act as psychopomp to a soldier. The similarities between the scene in First Avenger and A Matter of Life and Death are inescapable. The cuts between the two, the brave soldier on his last flight, the absolutely willingness to go out on their own terms, and that long slow shot of a grief-stricken woman. The trick of A Matter of Life and Death is that this all happens at the beginning of the film. Not the end. The long haul isn’t towards a declaration of love like First Avenger, but something much more esoteric. Plot-wise it’s all very simple. The soldier survives, he finds the girl, and up in heaven the real psychopomp realizes they missed him and has to convince the soldier to just give it all up and die. He refuses and so Heaven convenes to hold a trial. Neatly we never learn if Heaven is real or just in his head, because his new girlfriend, alarmed by his talk of angels trying to take him away, has him see a doctor who diagnoses an illness that can be resolved with surgery. The trial happens while he’s on the table, between life and death. It’s the kind of grand fantasy that can come across as incredibly silly in a live-action movie. Like a comic book it’s big, bold melodrama. The epic used to pursue ruminations on the small. But the directors, Michael Powell and Emeric Pressburger, handle everything in a distinctly “stiff upper lip” sort of way. Death is very clearly not the end. Just a bittersweet parting with a promise of reunion on the other side.